Its a gorgeous winter morning. It has drizzled the previous night so its bone chilling cold. At least for me. We sip coffee sitting at the porch overlooking a stunning view of the mountains around. Honestly this is what life should be. I tell the boy…we should plan our retirement home somewhere close by. I had changed my attire to something more first-week-bride-appropriate. Bindi, earrings everything imaginable. Not typically the outfit that you would choose to wear to a hill station, but what to do. 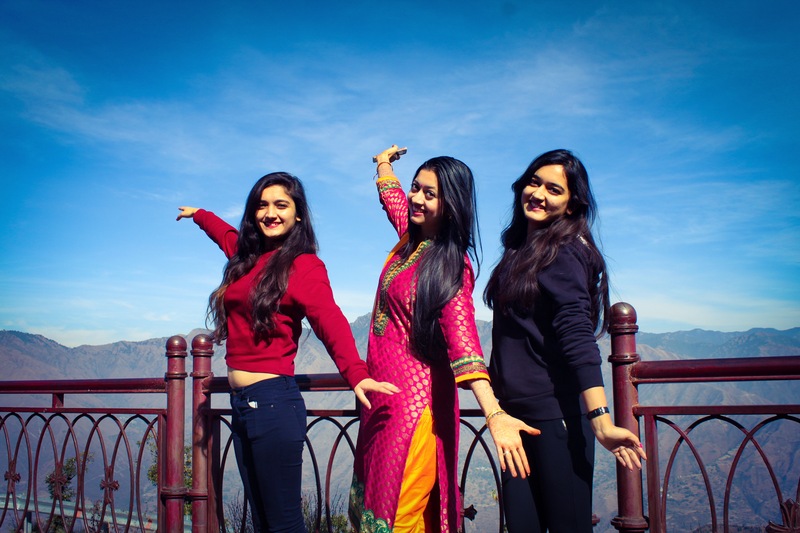 Mussoorie was just 45 mins drive from maasi’s place so we decided to spend the day out there. The weather was perfect and the traffic was all moving down towards Delhi, and not towards the hill station. Only because it was crazy cold. My teeth were chattering throughout but the weather was super romantic. We went on the drive with two cousins who were equally excited to be around their new bhabhi and bhaiya. I am practically in their age group minus a few years here and there, but one marriage tag…and suddenly you’re the older one. Breaks my heart you know. It was going to be a fun long day. We had packed all our supplies – chips, soft drinks and sandwiches. The drive to mussoorie was amazing. We could see snow-capped mountains from where we stood. It was a breath-taking view. I have never seen snow in real, and to get to see it even from a distance…it was amazing. The entire route to Mussoorie is scenic. While some might argue that the place is overtly commercialized, which I do agree.. if you are a nature lover…then you will enjoy the ride to Mussoorie for sure. Every corner of the road was a worth clicking pictures in. From picturesque mountains as background to little cute corners made at every turn for tourists to click pictures in…we went bonkers here. Our driver was so bugged by the end of it…we just wouldn’t let him drive. It also didn’t help that we were 3 photo crazy girls..we reached our destination only close to 2 hours later. I think for anyone who goes to Mussoorie, this is by default the first & last stop. Every tourist sight seeing place in Mussoorie is in and around the kempty falls. And yes, this place is seriously commercialized. Because of the rains, the temperature had further fallen, and luckily or unluckily for us…there was hardly any crowd out today. The downside…we could barely walk because of the cold. We had to click pictures, because how else do you justify going to Mussoorie if you haven’t stood in front of the kempty falls. So shivering and with frozen hands tucked deep inside our pockets, we managed to click some shots in front of the waterfall. I seriously cannot begin to imagine what those guys who were in the water thinking. We clicked the photos standing on the bridge and all along we could feel water droplets on us…and every time it would hit us, one of us would squeal out in pain. The air was too cold because of the water. We were so glad we got our jackets, but somewhere I wish we had come better prepared wearing inner thermal and other winter wear. Within no time I couldn’t feel my feet. This was not my first time to Mussoorie. I had been here once before when I was a kid. Back then, rope way was something out of the world. I still held those childhood memories of this place and I was soo excited to get on that rope-way again. Only this time, the place was so shabby…people had thrown plastics, chips packets and all kinds of garbage down the hill. That was the only view that stuck to the head when in that rope-way. I felt really bad…it is a tourist spot. I agree. But the responsibility is on all of us, residents included to maintain the place. I wish they had kept it in a better condition, but it is what it is. The only eatable item you get in the market is bhutta. We paid 50 bucks for one bhutta ! The road to the rope way is pretty fun. It goes through this alley of street shopping stalls. They have cute stuff, from jewellery to sweaters, cheap sunglasses, monkey caps…all the usual tourist like things. Absurd prices but you can easily bargain your way through. From where I stand. Can you see how much we had to walk to reach this place? Probably the highlight of the day. This place was in the same vicinity as the Kemty Falls. But one has to walk quite a bit to reach this location. The place is at the bottom of the valley and the steps leading to it is dangerously slippery and steep. We took our time to reach the place and by the time we finally made it, we were starved. Every ounce of our energy had gone. Also, it didn’t help that it was close to 3pm and we had unknowingly skipped our lunch. So we walked towards the closest restaurant (shack)…and saw the menu. It was a simple decision. There are only pakoda and maggi available. Price fixed. 50 bucks per plate. I think he served us half a packet of maggi per person, but in that chilly winter breeze, maggi felt so so good. We were quite exhausted from our morning ‘adventures’ so we decided to laze around a little bit. There was a paddle boating option right next to the restaurant so we thought it would be fun to do that for a little while. There are multiple adventure sports available in the premises but the only one working that time was the zipline. It was an off season, so most of the adventure sports guys were also missing from the area. If you go at the right time, then you can even take up activities like valley crossing, sky bridge and rock climbing. Zip Line is actually quite fun. Everyone except for me did it…I was not too adventurous about hanging in thin air…but my cousins really loved it. Its hardly a one minute activity but you do get a adrenaline rush when you do it. May be next time I might do it when I’m dressed appropriately. Our last stop was the local market in Mussoorie. For a small hill station, its really really crowded. Its a busy street and they have everything from coffee shops to sweet bakery shops, restaurants and some cute shops. Overall, it had been a good good day. It was a break from the wedding chaos, and I loved spending time with my new cousins, my new husband while soaking in the winter chill of Mussoorie. It was a perfect day. We reached home really late and then realized how tired we were. Next day was going to be crazzzyy. We had to travel 4-5 hours on the steep hills in the remote area of Uttarakhand. We were going to our family village for the last reception. But this celebration lasted a good one week. You have read the preview of the village right…if you’ve forgotten, you can have a look here.